Mancherjee Bhownaggree (1851-1933) came to Britain from Bombay (now Mumbai) to study law in 1882. * He was part of an informal network of western-educated Indian reformists based in late-Victorian London that included Dadabhai Naoroji (1825-1917). Naoroji was elected Liberal MP for Finsbury North in east London in 1892, becoming Britain’s first Asian MP – by a margin of just five votes. Although he had played a part in Naoroji’s successful election campaign, Bhownaggree rapidly became disillusioned with the Liberal policies Naoroji favoured and by 1894 he was seeking party backing to stand for election as a Conservative candidate. The Conservative party welcomed the chance to manage the political career of a man they believed would provide valuable support in their efforts to combat the influence of the Indian National Congress both in India and Britain; and in 1895 Bhownaggree was selected as the Conservative candidate for Bethnal Green North East in east London. Campaign flyer (front). George Howell Archive, Bishopsgate Institute. Campaign flyer (reverse). George Howell Archive at Bishopsgate Institute. Increased rent; overcrowding and insanitary dwellings; sweated trades; and competition for jobs. 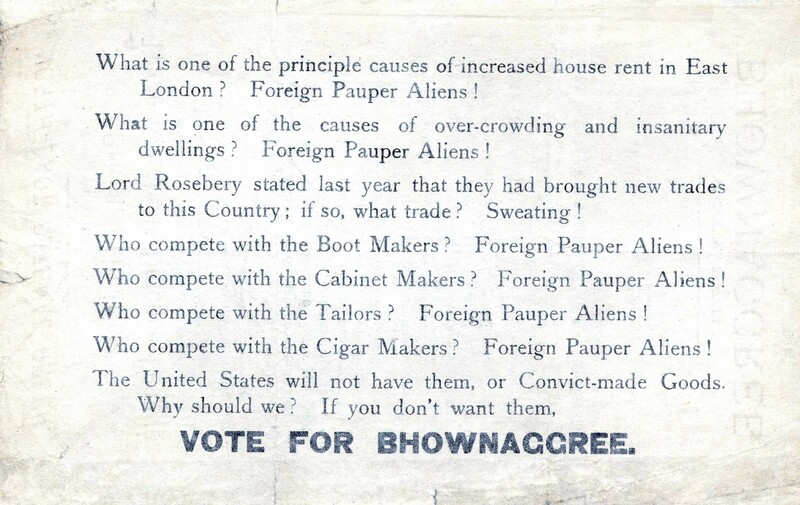 Bhownaggree’s was a campaign seemingly exclusively concerned to appeal to workers’ anxieties around ‘foreign pauper aliens’ an especially hotly-contested topic in the late-Victorian East End due to the relatively large Eastern European population that had settled around Whitechapel and Stepney, in particular, since the 1880s. 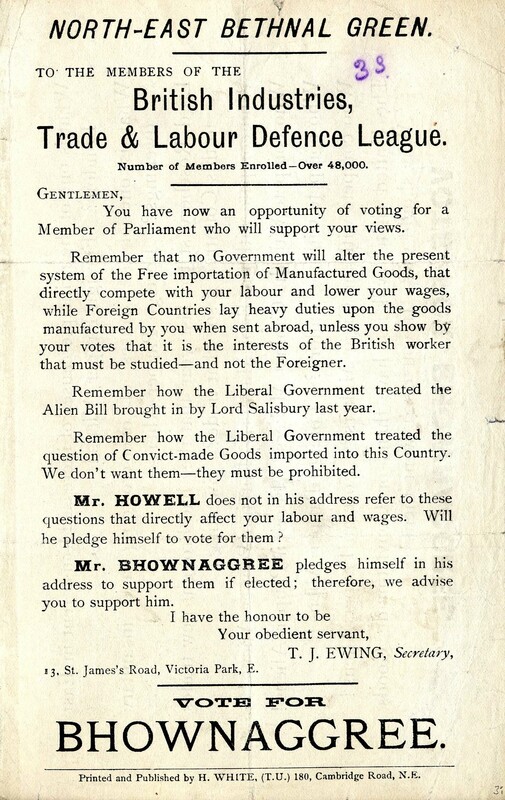 According to Hinnells and Ralph (reference below), it was local concerns about immigration ‘plus a good oratory style, an arduous and effective campaign, some Liberal complacency and a national swing towards the Tories, [that] provided the combination of factors which yielded the surprising success.’ The ‘surprising success’ being that Bhownaggree defeated Howell to win the Bethnal Green North East election. A popular constituency MP, Bhownaggree was re-elected in 1900 on an increased majority. The awkward fact that Britain’s first ever Asian Conservative MP gained electoral success by running an outspoken campaign against ‘foreign pauper aliens’ may explain why the early story of minority representation in Britain has never been sufficiently analysed or celebrated in wider historical narratives. Few people today are aware that London had two Asian MPs in the 1890s. This is surely partly because the case of Mancherjee Bhownaggree cannot be at all comfortably accommodated within the most immediately relevant or obvious existing thematic frameworks, such as empire, colonialism, post-colonialism or multiculturalism. Yet Bhownaggree’s political career is an intriguing and singular one. As Hinnells and Ralph have pointed out, he has been harshly treated by posterity, most notably in India where an argument with one rival damaged his reputation in a media that not only nicknamed him ‘Bow-and-Agree’, for what was seen as his slavish support for Anglo-Indians (that is, British people living in India), but also and frequently subjected him to personal insults – including the title of this piece, taken from the Madras Standard of 1897. Other sources suggest a more positive interpretation is possible. Sensitively handled, the career of the ‘Bethnal Green Humpty Dumpty’ has much to tell us about such topics as: Anglo-Indian relations and networks; working men’s voting patterns in east London; grass roots responses to immigration in the East End; and minority representation in Britain since the end of the nineteenth century. I would certainly be interested to read a comparative study of the lives and achievements of Naoroji and Bhownaggree. *The content of this post – including the Madras Standard reference – is largely taken from John R. Hinnells and Omar Ralph Mancherjee Bhownaggree 1851-1933 (1995), which itself drew upon an unpublished M.phil thesis by C. Monk ‘Members for India’ (1985). Additional biographical information is available here. The post was inspired by an accidental discovery in the George Howell archive at Bishopsgate Institute. The images are from the Howell archive. They have been reproduced by kind permission of the Institute. On Saturday I visited the News from Nowhere Club in East London to give a talk on the history of the Eton Manor Boys’ Club. It was a really enjoyable evening with some great questions at the end from an attentive and interested audience. It was especially lovely to have a couple of Eton Manor ‘Old Boys’ present. Not least because it saved me from having to sing the club song as a solo towards the end of the talk. 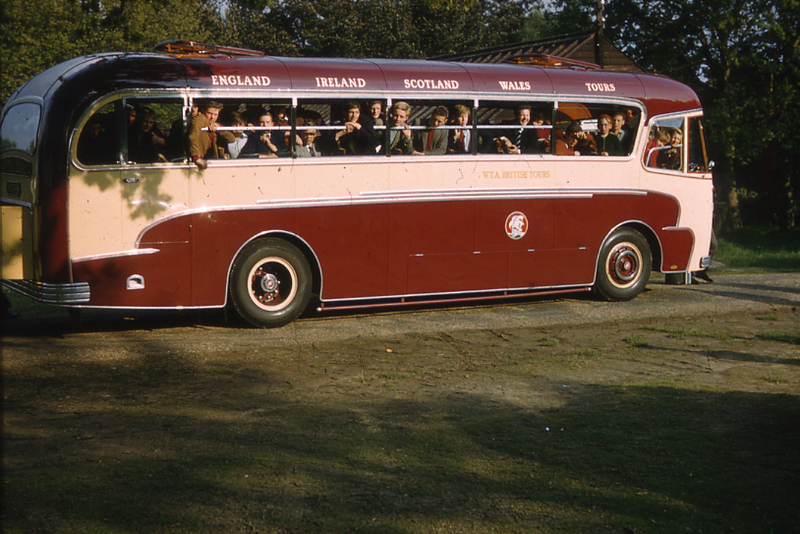 Thanks to Brian Cole, in particular, for travelling so far to join us – and for kindly donating two items of club ephemera from his personal collection to the Eton Manor archive. I promised to share the content of the talk as a pdf so that those unable to attend could read it in document form. Unfortunately I can’t share the 80+ images I showed as part of the talk but these are freely available to view and enjoy in the Bishopsgate Institute archive (for anyone able to travel to central London). 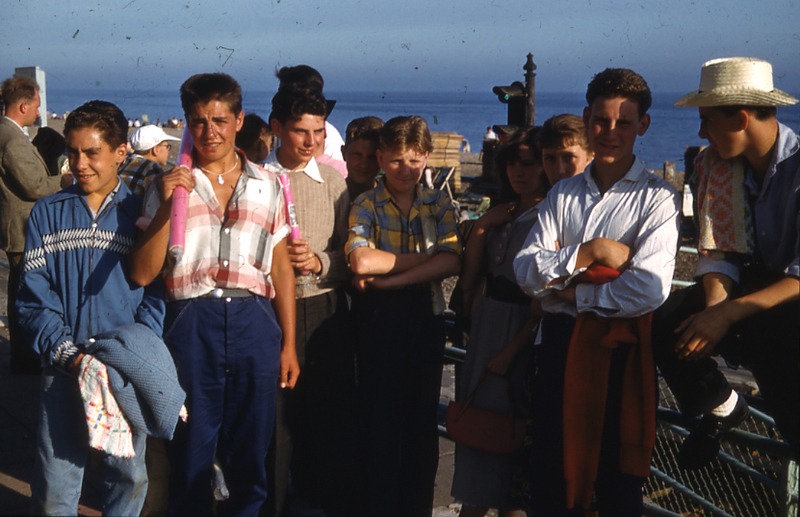 To indicate the riches in the archive, here are three photographs from a set of colour slides donated by Club ‘Old Boy’ Peter Wilson. 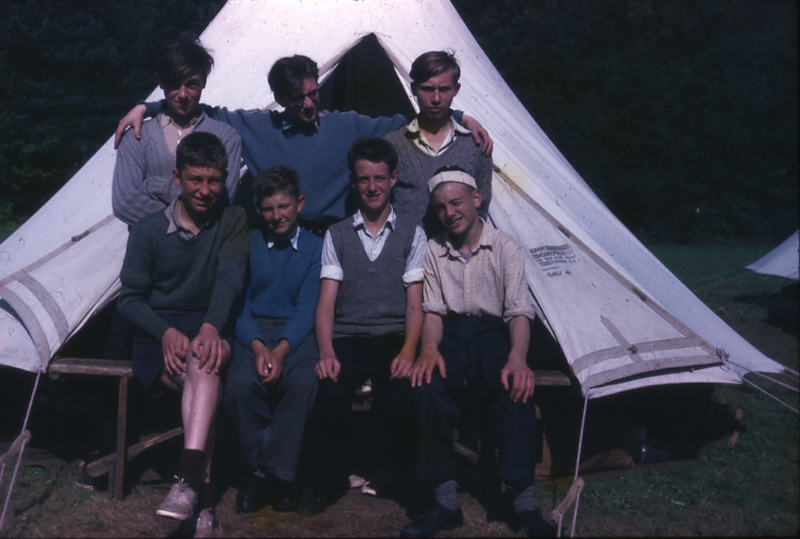 The images show Eton Manorites at summer camp during the late 1950s and are reproduced here with the permission of Bishopsgate Institute & Archive.